Every now and then, there comes a time where you will need to get a ring resized. Whether it’s a surprise engagement and your S.O. got the wrong size or just bought a gorgeous vintage ring, getting your baubles to fit your fingers is as important as the perfectly tailored blazer. Having a proper fit will ensure that the ring is comfortable to wear every day and something you will love to put on. If it's too loose, then you'll be constantly worried about losing the ring. If it is too tight, you'll fret about ever getting it off. We want you to love wearing your ring as much as anyone else, so to ensure you get the right ring size, we spoke with Alexis Adams of Esqueleto for the steps you need to take. “Resizing can take anywhere from a few days to a couple weeks, depending on how busy the jeweler is,” Adams says. “It involves slicing open the band and either taking a chunk of the metal or adding in more." She notes that the price can fluctuate based on the metal of choice and how big of a change you're making, but she estimates it's usually something under $200. Already have a ring in mind? “In most cases, if you need a ring resized, it’s best to bring it back to the retailer,” says Adams. Most fine jewelry stories will be able to resize your ring in-house. If not, they should have a jeweler to recommend. In the chance that you can’t bring it back to the original retailer, Adams suggests doing your research and finding a jeweler you trust. Now, shop our favorite rings on the market that you’ll never want to take off. Yes, rose gold is still huge. This layered look is so unique. You won't ever get tired of this ring. The details in this are so elegant. You can't say no to Harry Winston. This ring will look so good on you. 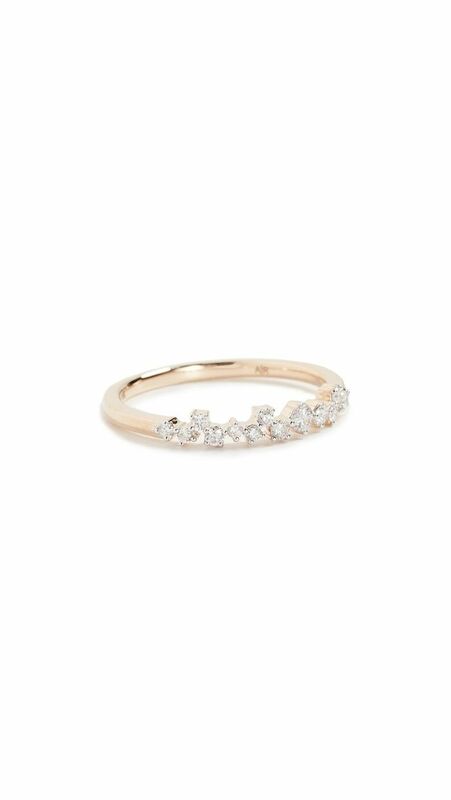 This ring embodies simple elegance. You won't be able to stop staring at your finger with this on. Even the band is cool. For the bride who finds herself on the unconventional side. A hexagon ring is so unexpected. A pear shape is a classic shape that'll catch anyone's eye. For the woman who loves some extra sparkle. With the right fit, we're sure you'll never want to take these rings off, whether you prefer a vintage-inspired ring or a modern classic.